Forking “The most polar neutral compound synthesized” into m-benzyne. Dielectric relaxation studies of glycine–water mixtures yield values that range from 15.7D to 11.9D although these have to be derived using various approximations and assumptions for up to 4 independent Debye processes. 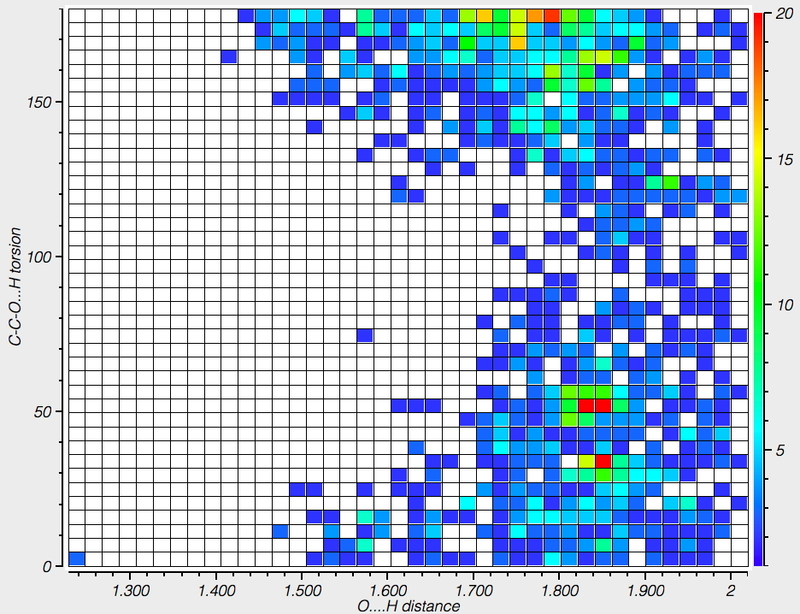 Before proceeding to calculations, I looked at the properties of ionized amino acids in the solid state, using the following search query for the Cambridge structure database (CSD). The distance measures hydrogen bonds to the carboxylate oxygens and the torsion their orientation. The O…H hydrogen bond distances vary between 1.7-1.85Å, which are short. The orientation of the hydrogen bond can be to the in-plane oxygen “σ-lone pair” (torsion 0 or 180°) and also an out-of-plane ~π form (torsion ~60-90°). The solvated form is shown below, in one specific conformation of the three studied (ωB97XD/Def2-TZVPP/SCRF=water). The calculated O…H hydrogen bond lengths fall into the range revealed from crystal structures. The calculated dipole moments range from 12.6 (DOI: 10.14469/hpc/2007), 15.3 (DOI: 10.14469/hpc/2006) and 14.9D (DOI: 10.14469/hpc/2005), which is a modest increase over the model with no explicit water molecules. 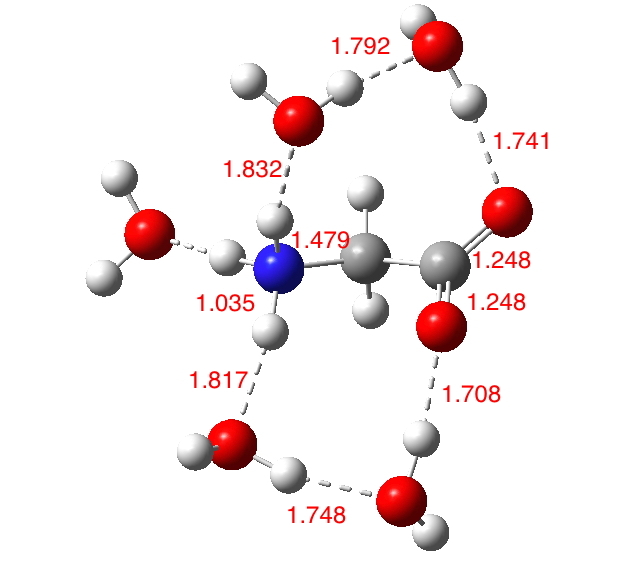 The actual dipole is of course a Boltzmann average over these and other as yet unexplored conformations, as well as other values for the number of water molecules. 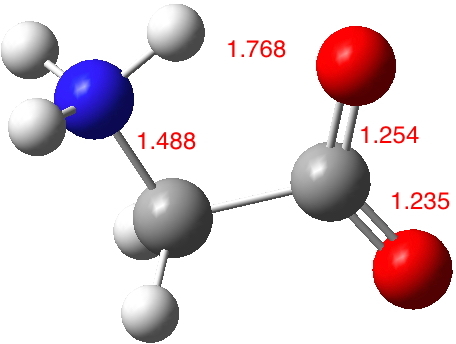 Given the difficulties in interpreting the dipole moment of a complex Debye system such as hydrated glycine, the agreement between the limited range of solvated models and the measured values seems reasonable, and provides at least some measure of “calibration” for the polar molecules commented on previously. ‡Optimized with the solvent field on. If a vacuum model is used, the proton transfers from the N to the O. This entry was posted on Saturday, December 24th, 2016 at 8:19 am and is filed under crystal_structure_mining, Interesting chemistry. You can follow any responses to this entry through the RSS 2.0 feed. You can leave a response, or trackback from your own site.